To say Christa Vasile loves Christmas is an understatement. She always sets the Best Christmas Plan Ever into motion on Nov. 1, with the goal of outdoing the previous year’s celebration. This year’s excellence has already surpassed the others, as Christa and her parents will be going to Europe. But then her parents drop the bad news: they’re getting a divorce, and the “coppery”-skinned 13-year-old with “crazy-thick hair” and “eyes that crinkle up in the corners” (but no named race) and her similar-looking mother will go to Europe for some “mother-daughter time.” Christa’s actress mother will perform in venues throughout their trip, which means Christa has to join the “kid portion of [the] tour” with the other actors’ children: hyperexuberant Kylie, artist Sasha, Harry Potter superfan Owen, spiky-haired Logan, and cute hipster Colby. (Sasha is Asian; the rest appear to be white.) After Christa spies her mother making out with Kylie’s father, her hopes for a parental reunion go out like a candle in the wind. However, a surprise from her father lifts Christa’s spirits. He’s continuing their holiday scavenger hunt tradition with one dare for each of the 12 days of Christmas. 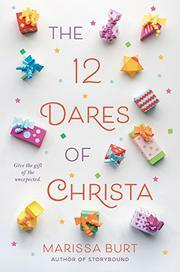 The tasks encourage Christa to allow the unexpected to lead her to new and exciting places. Her first-person present-tense narration carries the story, and Burt does an excellent job of bringing the magic of Europe to life on the page.